Celebrate Easter by hanging a beautiful handmade wreath on your front door. From cute bunnies, to beautiful flowers and colorful eggs, you'll surely find a DIY wreath perfect for your home. Continue to 2 of 22 below. Take a regular moss covered wreath and add tall ears to make a bunny outline. This wreath is understated and simple, but still fun. Continue to 3 of 22 below. This floral Easter egg wreath is the perfect way to use up all those extra plastic eggs you have from last year's Easter egg hunt by using them to craft a gorgeous wreath. Continue to 4 of 22 below. There are many variations of this quirky wreath that you can create, and this tutorial provide instructions for a few different ideas. Keep it simple with white pom-poms, a fun little nod to the Easter Bunny's famously fluffy tail, or use colorful poms for a fun springy wreath. Continue to 5 of 22 below. The children in your neighborhood are sure to adore this super cute fluffy bunny wreath that you can hang on your front door. Continue to 6 of 22 below. Combine small sprigs of flowers with pastel plastic eggs to create the perfect wreath to decorate your home for your upcoming Easter Egg hunt with your friends and family. Continue to 7 of 22 below. Leading up to Easter marshmallow Peeps are a popular sweet treat available for sale, but instead of eating the marshmallow bunnies try sticking them around a wreath to craft a cheerful rainbow Easter decor for your home. Continue to 8 of 22 below. Celebrate the first blooms of spring by showcasing your favorite spring flowers such as tulips and daffodils to enhance a grapevine wreath. to enhance a grapevine wreath. Continue to 9 of 22 below. Take a standard Easter wreath, and make it more glam by adding some trendy gold speckled accents on the eggs with this DIY project you are sure to enjoy crafting. Continue to 10 of 22 below. This sweet pom pom wreath with a cute bunny is the perfect DIY project for your front door as it is sure to make everyone who sees it smile. Continue to 11 of 22 below. Celebrate Easter and all things spring with a handmade burlap wreath that you can decorate with signs of spring, such as clusterings a few spring flowers and a nest with small eggs. Continue to 12 of 22 below. This butterfly wreath is perfect to decorate your home for spring and can be made out of inexpensive supplies found at the dollar store in just a few minutes. Continue to 13 of 22 below. This beautiful Easter wreath looks just like a nest, covered with moss and enhanced with a few eggs, it is the perfect way to decorate your porch this spring. Continue to 14 of 22 below. Nothing says Easter like a bunch of Easter eggs! 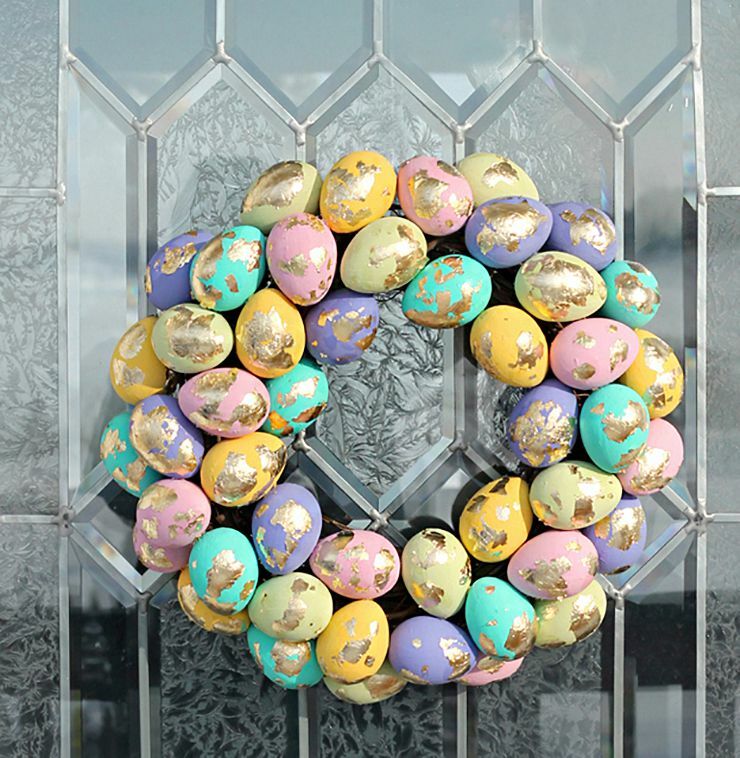 Spray paint your old Easter eggs and glue them to a wreath form to make a classic Easter wreath that you can use year after year to decorate your front door for spring. Continue to 15 of 22 below. In a hurry to decorate for Easter? You can give a new look to your current wreath by adding Easter eggs around the center of the wreath for a quick DIY update. Continue to 16 of 22 below. Cut out paper flowers in a variety of soft pastel colors and pin the paper flowers to foam wreath to make a new wreath for your home. Continue to 17 of 22 below. After the yard being cover in a soft blanket of snow, the return of a green yard is something most people get excited for. You can celebrate the spring green grass by DIYing a wreath that uses yarn to look like grass, by wrapping fuzzy yarn around a wrath. Once covered the spring grass wreath can be enhanced with small flowers and you will have the perfect wreath to hang this spring. Continue to 18 of 22 below. This evening relax by crafting a rustic Easter wreath for your front door by decorating a grapevine wreath with blue painted plastic eggs and small pieces of moss for a timeless classic Easter wreath that anyone can make. Continue to 19 of 22 below. For a modern and minimalist looking Easter wreath, this DIY floral monogram wreath is perfect. Enhance a wire wreath with a few pieces of greenery, and in the middle customize the wreath with your initial made out of multicolored flowers. Continue to 20 of 22 below. If you have a covered front porch where the front door is protected from rain, this pastel leaves wreath is an affordable DIY project to make as a family as you can cover the wreath with cut leaves out of cardstock paper. Continue to 21 of 22 below. This rustic moss covered birdhouse wreath celebrates the return of birds and the start of spring and is a great DIY wreath to decorate your front door all spring. Continue to 22 of 22 below. Inspired by Robin egg's blue speckled eggs, this DIY speckled egg wreath is made out of painted paper mache eggs that are stringed together for a spring project the entire family can work on together.